As a member of the Music Together® family, you have access to the Family Music Zone™. Here, you’ll be able to download this semester’s songs, view a digital copy of your songbook, get new activities to try at home, and learn more about your child’s music development. 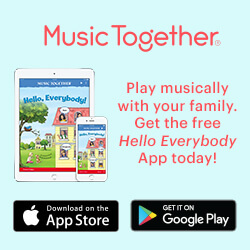 To access the Family Music Zone, visit https://www.musictogether.com/account. Create an account using the code found on the inside back cover of your CD booklet for the current session.